Acupuncture alone or with the medication may not be effective in treating infertility in women suffering from polycystic ovary syndrome (PCOS), a study has said. PCOS is a hormonal disorder causing small cysts on the outer edges of the ovaries, which in turn results in them getting enlarged. Clomiphene is the first-line of treatment used to induce ovulation in women with PCOS. The findings suggested that active acupuncture, with or without Clomiphene compared to control acupuncture and placebo medication did not increase live births. 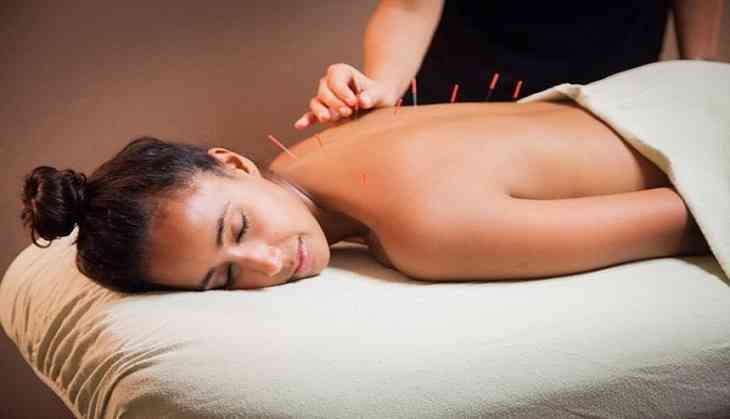 Study author Richard S. Legro from Pennsylvania State University in the United States said women undergoing acupuncture with Clomiphene would do much better than women receiving only acupuncture or only clomiphene. PCOS, which affects an estimated five to 10 percent of women of reproductive age worldwide, is the most common cause of female infertility. The researchers studied whether or not the traditional Chinese medicine therapy could be a supplemental treatment along with Clomiphene to improve pregnancy outcomes. They analysed 1,000 Chinese women with PCOS at 21 sites. The women were divided into four groups in which they received one of four interventions: Clomiphene plus active acupuncture; Clomiphene plus controlled acupuncture (also called placebo acupuncture or mock acupuncture); placebo medication plus active acupuncture; or placebo medication plus controlled acupuncture. The women were given active or controlled acupuncture twice a week in addition to Clomiphene or placebo medication for five days per ovulation cycle for up to six months. The researchers kept a tab on all 926 women who had completed the trial for 10 months and beyond. "There is an impression out there that acupuncture and conventional treatment improves pregnancy success rates, but this study shows acupuncture added nothing beyond medication," Legro said.